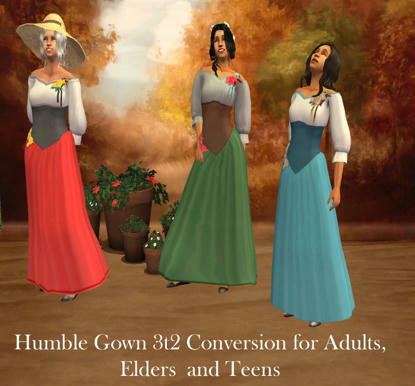 Shades of Pleasantview: Sims 3t2 Conversion : Happily Ever After Humble Gowns. 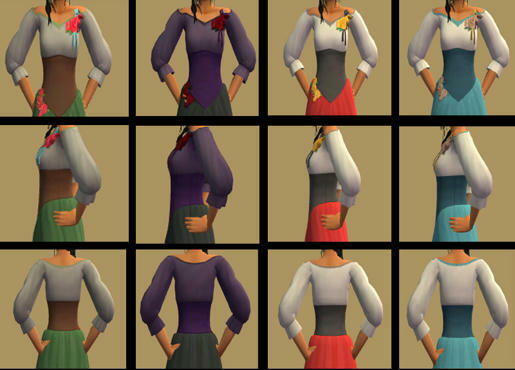 Sims 3t2 Conversion : Happily Ever After Humble Gowns. I'm way, way behind with my backlog of goodies to share over at Plum Bob Keep. (Oops. Just moved), But all that pent-up energy had to find an outlet somewhere - here's the result of a week in a new flat with no internet! I finally figured out how to do conversions for Teens and Elders, so they aren't left out whilst my female adults are prancing around in all their converted best! This is the Humble Gown from the Sims 3 Store 'Happily Ever After Set'. I have much more to come from that set for ladies!